RAWHIDE is fully digestible. Farm Food Rawhide is solely made of fully digestible hypodermic interstitial tissue. Therefore the dog can easily digest the complete Rawhide with no trouble at all. Although Farm Food Rawhide is fully digestible the nutritional value is almost zero. RAWHIDE is absolutely clean and save. 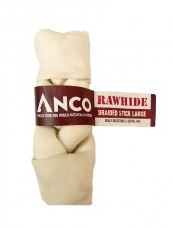 RAWHIDE does not cause allergic reactions. The above mentioned arguments make sure that allergic or intolerance reactions are unlikely to appear with Farm Food Rawhide. This in contrast to many, anonymous chew-products. It is more and more proven that food allergies are caused by impure, anonymous chewproducts. Farm Food Rawhide can often been given to dogs that suffer from food-allergies without any problem assuming that it is not a beef allergy.